Full suspension trail bikes don't need to reinvent the wheel to work well. The simple, understated single pivot design of the Taros uses sealed cartridge bearings to deliver smooth, durable performance, and 120mm of suspension travel will take the edge off all but the biggest roots and rocks on the trail. The frame is built using trusted 6061-t6 aluminum alloy, so you know it's strong, and the formed and butted tubing makes sure to save weight wherever possible. With quick and stable 27.5 inch wheels, a SRAM 1x9 drivetrain, and aggressive Kendal tires, you'll have fun every time you head out on the trails. Diamondback Atroz 27.5 Mountain Bike - 2017. A full suspension bike doesn't need to be overly complicated. That's the beauty of the Diamondback Atroz mountain bike. Its simple and reliable full-suspension design smooths out roots and rocks, so your body doesn't absorb the impact. With modern components and great features from the brands you trust, the Atroz pretty much sells itself. 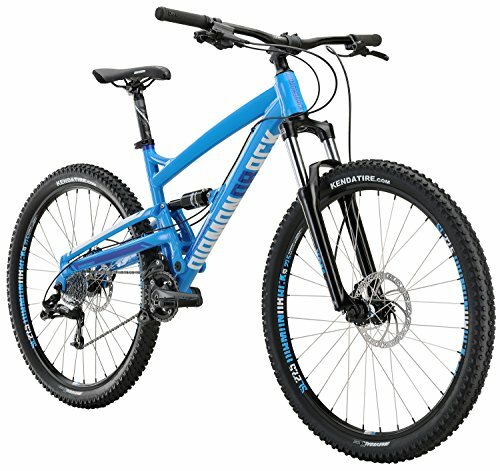 The increased performance of a full suspension mountain bike can still be a great value. The simple, understated single pivot design of the Atroz uses sealed cartridge bearings to deliver smooth, durable performance, and 120mm of suspension travel will take the edge off all but the biggest roots and rocks on the trail. The frame is built using trusted aluminum alloy, so you know it's strong, and the formed and butted tubing makes sure to save weight wherever possible. With quick and stable 27.5 wheels, a SRAM1x9 drivetrain, and aggressive Kenda Nevegal tires, you'll have fun every time you head out on the trails. 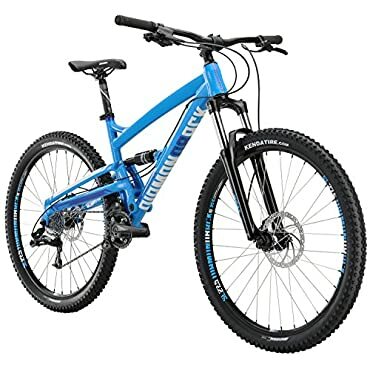 Diamondback 2019 Atroz 3 Mountain Bike M / 18"
Last updated: April 20, 2019 at 11:40 EST. Pricing information is provided by the listed merchants. GoSale.com is not responsible for the accuracy of pricing information, product information or the images provided. Product prices and availability is subject to change. Any price and availability information displayed on amazon.com or other merchants at the time of purchase will apply to the purchase of the product. As always, be sure to visit the merchant's site to review and verify product information, price, and shipping costs. GoSale.com is not responsible for the content and opinions contained in customer submitted reviews.